The NRL grand final will boil down to an elite attack versus the league's premier defensive unit, as Cronulla seeks to break down the Melbourne wall. People love to say defence wins championships, despite the fact that a superior attack can completely dismantle it. Just ask the 2015 Broncos. And that is what the Sharks will look to do against the Storm when they face off in the decider at Sydney's Olympic stadium on Sunday. But before we try to decipher what will happen on Sunday, we have to look back at what went down between these two in 2016. Wins were split as these teams faced off in round four and round 26 of 2016. In late March, Melbourne travelled to Shark Park to take on a 1-2 Cronulla side that had just lost to Manly. If they knew then what they know now, the Storm may have approached the game differently, because the Sharks ran riot as they kicked off their 15-game winning streak in style. Regularly going down the right side, Melbourne was unbelievably lucky the loss was not worse than 6-14 as winger Valentine Holmes dropped the ball three times with the tryline in sight. But that Storm side was in the midst of a horror backline injury run and that defensive leak has been plugged since, although the Jack Bird-Holmes could still prove lethal for Cheyse Blair and Marika Koroibete. Ultimately, Cronulla broke the Storm through the middle, with James Maloney linking with Ben Barba on an outside-in play, before Holmes stormed past the ruck to put half-back Chad Townsend over for the team's second try. The one four-pointer the Storm did score came when Felise Kaufusi powered on to a Blake Green short ball and ran over between Luke Lewis and Townsend, a combination the Storm's big men will surely target again on Sunday. It was a completely different story when they met in round 26. With the minor premiership on the line, Melbourne outclassed Cronulla and seemed in control from go to woe. The Storm employed something of a trick shot to get over the line in first place, with former journeyman Blair becoming a target as he twice darted through gaps in the defence to touch down either side of half-time. On the other side of the field, Cooper Cronk kicking to Suliasi Vunivalu has borne fruit all year, did so in round 26, and should do so again in the grand final if he the scintillating rookie can get in a one-on-one contest with Sosaia Feki. The Storm's final try in this pivotal clash came when Cameron Smith scooted from dummy half, fooling marker Michael Ennis with a head fake and holding up a short pass to Jesse Bromwich until the last second. Obviously the battle up the guts will go a long way to deciding the premiership. Defence, defending, tackling and stopping the Sharks from scoring. Yep, defence is the backbone, hips, skull and legs of this Melbourne side. The Storm's structures are always good. They are as well drilled as any side in the NRL and have arguably the best coach in the league, but their ability to scramble has saved them at times in 2016. 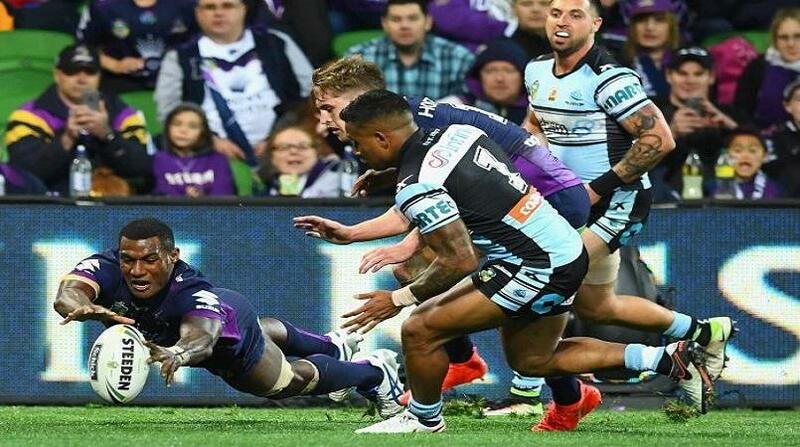 A missile-like hit by Koroibete on Holmes just before half-time in round 26 saved a certain try that could have swung the game Cronulla's way. On the other side of the field, Will Chambers was on the spot to make a last-ditch play on Feki, stopping a certain try. The premier defence in the league allowed just 324 points from 26 games this year (an average of 12.5 per game) and when they get the ball in hand they are equally as frustrating. No-one controls a game better than Smith and Cronk. Some players just make the 'right' play seemingly every time up the field, and the Storm are lucky enough to have two of them. If they sense their team needs a break, they will find one. If they sense the opposition tiring, they will pile on the pressure. If a situation calls for both, you can bet your bottom dollar one or the other will find a way to pin Sharks on their line. 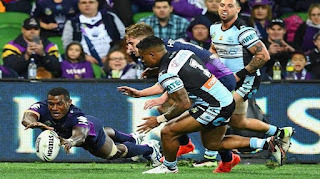 They also have X-factor players like Koroibete, Vunivalu, Bromwich and Cameron Munster who can pull off the sensational at any moment, but they do not want to rely on that. The Storm do not chase. They are front runners. Look elsewhere if you need an explosion of points. Let's be honest, the Storm were deserved but lucky victors in their preliminary final against Canberra. The Raiders, the NRL's top point-scorers in 2016, had Melbourne on the ropes with their fist cocked for the knock-out blow before Edrick Lee bottled a couple of golden opportunities. If Lee had stickier mitts in the grand final qualifier, it would be Canberra preparing for a trip to Sydney with Melbourne left to lick its wounds. The men from the nation's capital scared the Storm by throwing caution to the wind and going side to side to get the ball around Melbourne's defence, forcing it to slide, stretch, bend and break. There are not many teams that can match the Raiders for sheer speed, strength and offensive unpredictability, but one that can is in the grand final. Cronulla has possibly the fastest set of backs in the league with the skill set to boot. Barba remembered how to play once hitting the Shire, Holmes has continued his emergence as an elite winger, Bird is one of the best ball-playing centres in the game, and their brilliance has overshadowed the power of Ricky Leutele and Feki on the other side of the field. Up front, Ennis' last season has probably been his best, Andrew Fifita — for all his faults — continues to steamroll everyone in sight, and Paul Gallen will be ready to inspire his troops for one last big push towards a drought-breaking premiership. But the men bridging the gap from forwards to backs are even more important. We all knew Maloney was good, but he has been a revelation since arriving in Cronulla and thoroughly deserved to be named Dally M five-eighth of the year in one of the most hotly contested battles for positional awards. Now if only Townsend could get to his level and stay there. The half-back was poor against Melbourne in the last round of the regular season and was hooked in the qualifying final against the Raiders, before bouncing back in the preliminary final against North Queensland. If he is firing as well, it could be a good night for success-starved Sharks fans.